Searching for a classic nylon dog leash in a lovely hue? Look no further than our Zack & Zoey Nylon Dog Leash in Ultra Violet! Add some durability and classic style to your walks with our Zack & Zoey Nylon Leash in Ultra Violet. 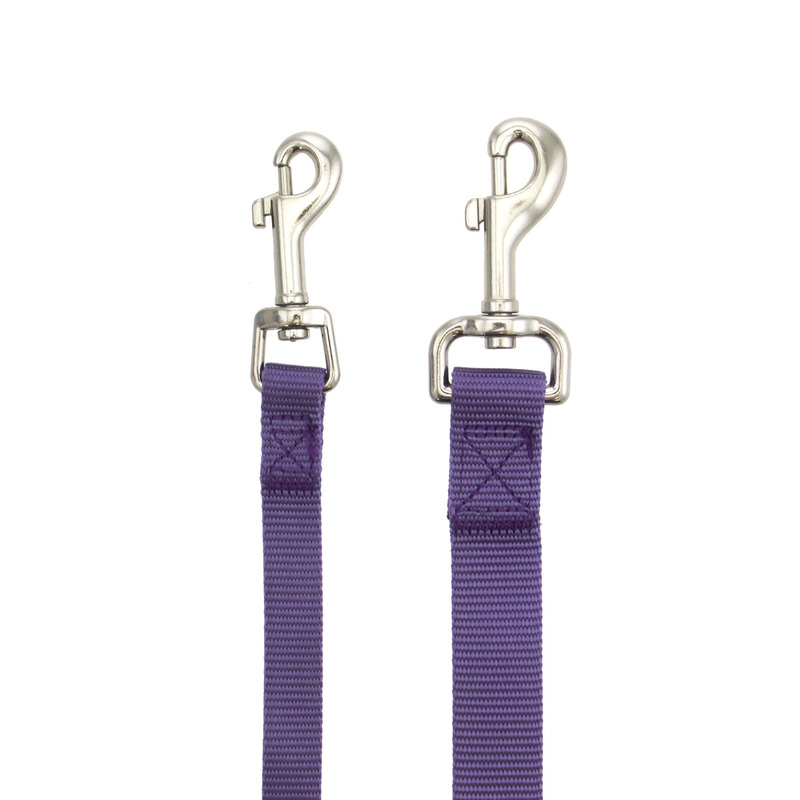 This purple nylon leash will be a staple for any dog or cat's walking wardrobe. Each leash features a nickel-plated swivel clip for a quick and secure attachment. The purple color will go with anything and is a great choice for spring and summer events. This leash is perfect for supporting your favorite sports teams that feature purple such as the Colorado Rockies and the Minnesota Vikings. 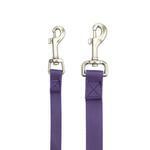 You will love the classic design of this nylon dog leash in Ultra Violet. Available in multiple colors. Matching couplers, collars, and dog harnesses are available too. Zack and Zoey Nylon Dog Leash - Ultra Violet Customer Photos - Send us your photo! Leash matches my raspberry sundae ombre harness, which is wonderful! Leash works great and matches harness perfectly! Posted On 11/09/17 by Sandy B from Canton, GA Yes, Sandy B recommends this product! Leash is well made and color matches harness perfectly. Posted On 09/13/17 by Cindi from Mohave Valley, AZ Yes, Cindi recommends this product! Zack and Zoey products are always high quality so when my husband lost our 2 dog's leashes in the river nearby where we live I knew right where to get them replaced... a great product from a great online store, love Baxter Boo! Posted On 06/20/17 by Marlene B from Richmond, Yes, Marlene B recommends this product! Leash works well and seems well made! I have the harness too. It's super cute and good quality and also soft. So like my dog pulls. And her other leash left brush burn marks and this leash doesn't do that. Posted On 04/14/17 by Cathy F from Martinez, GA Yes, Cathy F recommends this product! Ordered this leash for the color to match a harness I got for my little yorkie. Got the narrow one and it turned out it has a clip on almost as heavy as my dog. Had to return it, so disappointed,right color, wrong size. Need leashes for small dogs in assorted colors with small clips. Posted On 03/11/17 by Denise N from , Yes, Denise N recommends this product! LOVE this leash. Very good quality but what stands out is the very unique color. NOT purple, almost has an iridescence about it. So happy with it as well as the collar. Posted On 08/26/16 by Phyllis W from Philadelphia, PA Yes, Phyllis W recommends this product! Great width/color. Matches the ombre harness perfectly. This is a nice light weight leash for a small dog. Posted On 09/14/15 by Bobbie A from , CA Yes, Bobbie A recommends this product! This leash was exactly what I wanted. Posted On 08/07/15 by Joyce J from , FL Yes, Joyce J recommends this product! This is just the right color, to go with Missy's purple harness I got on here for her. The harness is great too. Posted On 07/13/15 by Pat F from Saugerties, NY Yes, Pat F recommends this product! This leash is light weight and very easy to attach to a harness or collar. It is great for small to medium dogs. Posted On 07/05/15 by Andrea S from , NC Yes, Andrea S recommends this product! Great product, especially for the price. It is a straight forward leash, and it does the job. I love the color! This is a perfect match to the purple collar and harness we purchased. Nice sturdy leash with solid clasp. Bright colors that match the collar colors. I couldn't believe that I was able to find this color AND in a 4 foot length. It's not exactly purple but darn near it. I wanted to replace an old leash I had. This is the first time I've been able to find a leash that will match my dog's collar. Love it. Super colorful and high quality leash! Posted On 11/07/13 by Marvin S from Newbury Park, CA Yes, Marvin S recommends this product! It's a leash and does what it's designed to do. I picked it up as a spare. Construction is good. However, I do prefer the one I bought locally as it is of heavier gauge nylon and feels better in the hand. So, I tend to grab that one. By comparison, this does feel a bit cheap. My little dog likes to grab on to this and chew while she's walking with her sister, so it is showing wear really quickly. I love the variety and prices. I will definitey shop here again!